Unpackage the RaceCapture system and included cable. 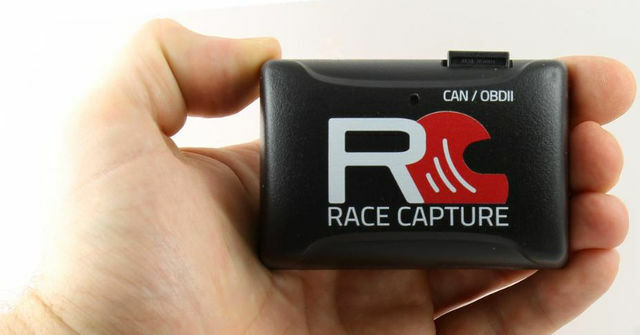 Place the RaceCapture unit on your dashboard with clear view of the sky. Position the system so it's square to the car's axis. You can get the latest Windows or OSX software from the software downloads page. Windows 10 and OSX: No drivers are needed for OSX or Windows 10. Windows XP, 7, 8: See the driver installation instructions below. 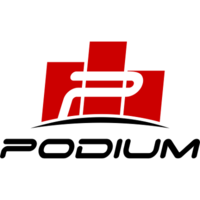 Once you've connected to the RaceCapture WiFi network, launch the RaceCapture app. The RaceCapture app will guide you through a brief automated setup and tour. During this process the connection to RaceCapture will be verified. 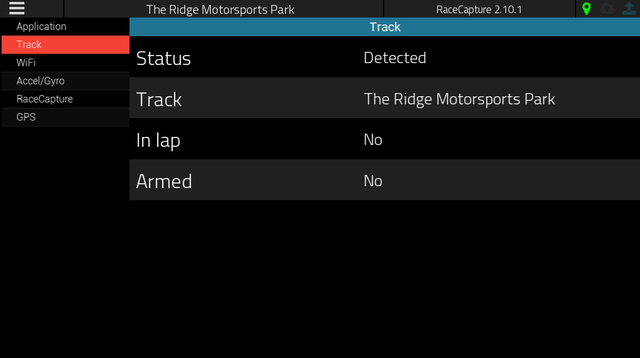 RaceCapture offers predictive lap timing, which relies on a robust track detection system leveraging hundreds of track maps worldwide. 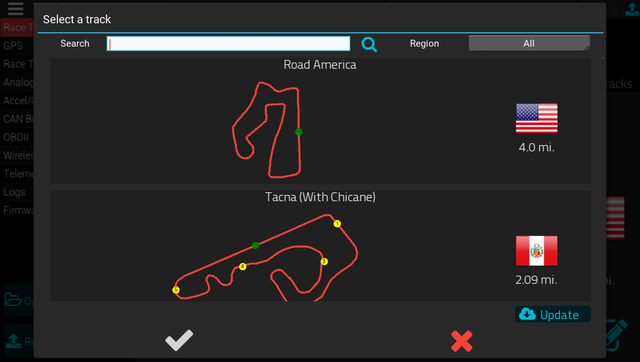 On the RaceTracks page you can create a custom track, which will be included in the library of track maps for automatic detection. 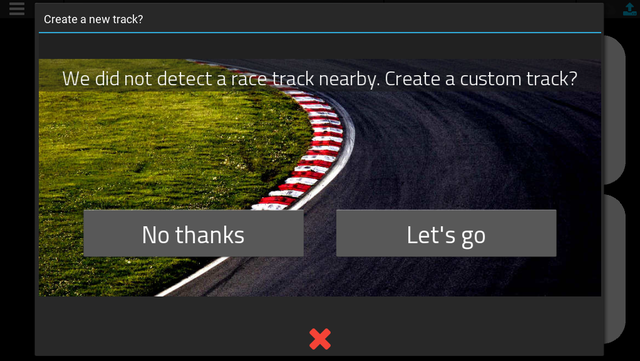 To create a custom track, turn off 'Automatic race track detection' and then press the add (+) button. 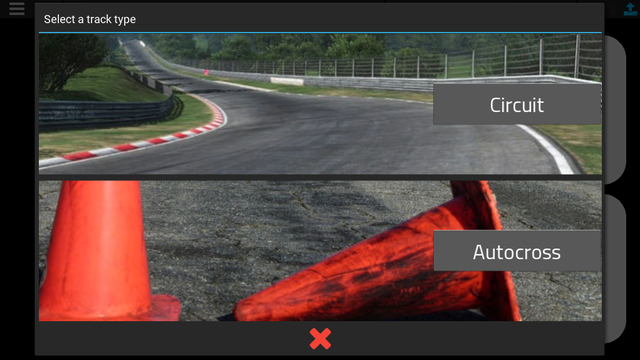 You will be presented with an option to create a circuit or Autocross (point-point) style course. 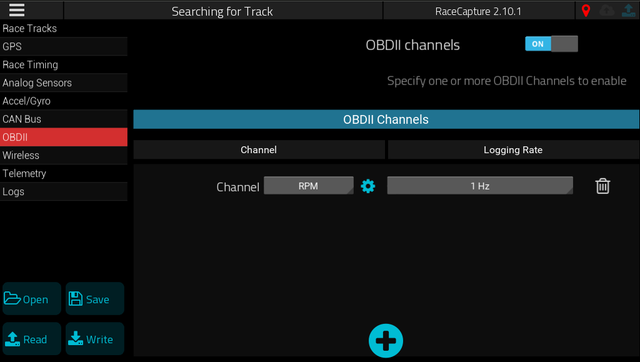 Follow the on-screen instructions to create your track. 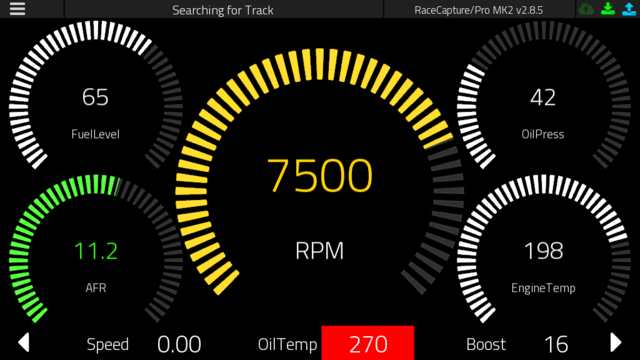 RaceCapture has one analog sensor that measures current battery voltage. The default 1Hz is the recommended sample rate. To disable, set the sample rate to 'Disabled'. Note: Normally you would not need to adjust these settings. Common baud rates for OBDII are 500K and 250K. The default is 500K, which applies to nearly every CAN OBDII vehicle. When telemetry is broadcasting, you will see a green cloud icon in the application toolbar. Hotspot mode: Older versions of Android will lose their internet connection when connected to a WiFi network that doesn't provide an internet connection. This is a common issue when connecting to WiFi enabled cameras such as GoPros and other WiFi enabled devices. Fortunately, iOS and newer versions of Android have the smarts to detect this condition and keep the cellular connection active, but older versions of Android will require an different approach. 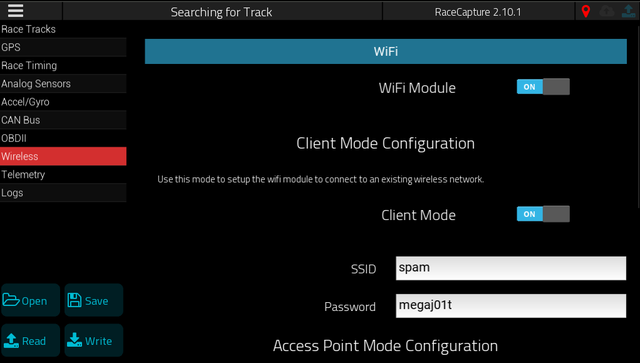 If you have a device that loses it's internet connection when connected to RaceCapture's WiFi network, you can solve this by enabling a hot spot on your device, and then configuring RaceCapture's WiFi interface by enabling the client configuration to connect to your hotspot, effectively reversing the connection. 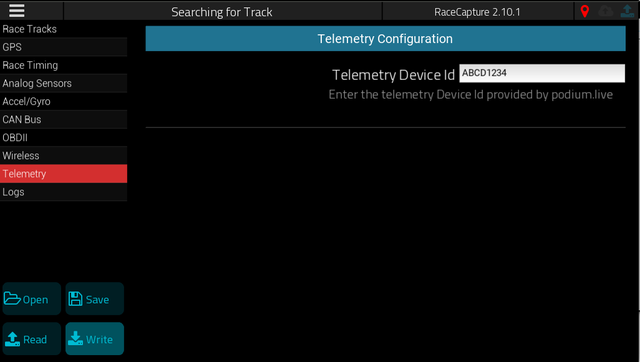 Once RaceCapture is configured to connect to your hotspot, it will automatically connect whenever your hotspot is turned on, and then you'll be able to broadcast telemetry to Podium. 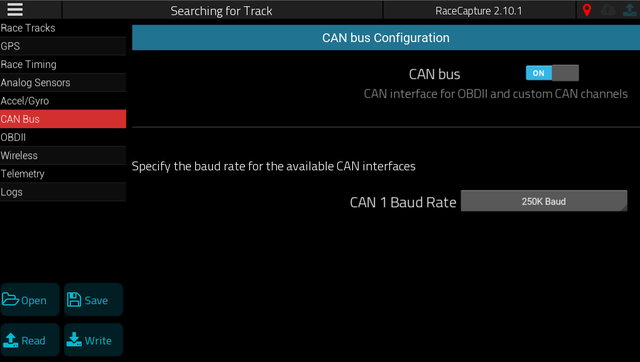 RaceRender provides native support for the RaceCapture log file format. Firmware update is performed using a Windows or OSX machine via the USB interface. Be sure you have the RaceCapture software installed on your computer before proceeding. Unzip this firmware archive to a location on your computer. 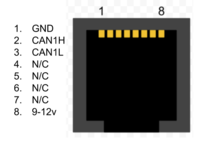 Connect your RaceCapture system to your Windows or OSX computer using the included USB cable. 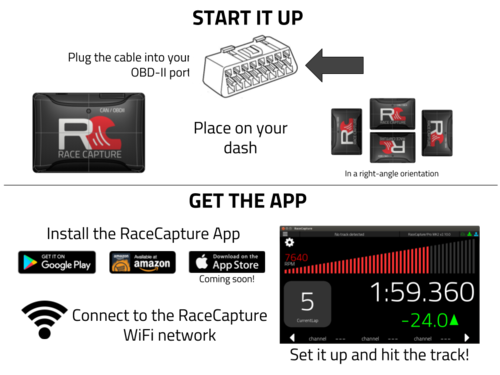 Run the RaceCapture app, and confirm that it is connected. Save your current configuration. The firmware upgrade may reset your RaceCapture device to a factory default. Press Read to read the current configuration and then press Save to save it to a file. Select the Firmware section in the left menu. The firmware will begin updating - watch for the progress to go 0-100%. Restore your saved configuration by pressing the Open button, selecting your saved configuration, and then Write it to your RaceCapture system. 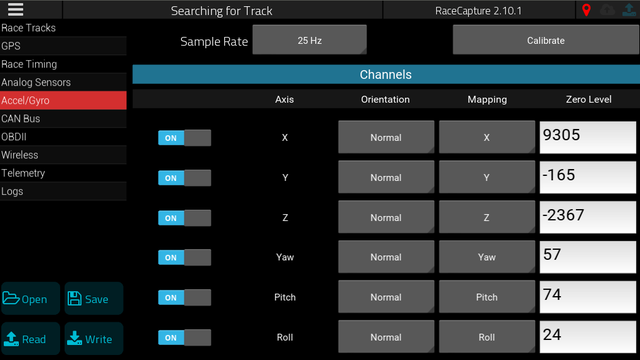 Confirm your firmware is updated by viewing the firmware version in the upper right corner of the RaceCapture app, after connecting. You can power RaceCapture using the included USB cable, plugged into your car's USB charger. Plug RaceCapture/Pro in to the computer. If prompted to install a driver, direct Windows to the folder where you unzipped the RaceCapture/Pro drivers. Open Windows Device Manager and find the Ports (COM and LPT) section. RaceCapture/Pro should be listed there, possibly with a yellow (!) over the icon. Right click and select 'Update Driver'. Follow the instructions and direct Windows to the folder where you unzipped the RaceCapture/Pro drivers. You can recover by re-configuring RaceCatpure's WiFi settings via the USB connection and the Windows or OSX app. Once you update the settings, it's recommended you test the WiFi connection using your mobile device while still connected over USB so you can further adjust settings as needed.